This week the Alaskan Interior was hit hard with a very out of character rain/ice storm. Lee and I were both worried that the rain and ice had left us with slush that would be too difficult to ski or snow shoe in, and winter would be ruined. But alas, the snow returned on Thursday and since then, we have received about 5 inches of the fluffiest snow Lee and I have ever seen. I’m sure you’ve heard that the Eskimos have umpteen different words for snow. This is, in fact, an urban legend. But I have been surprised by the different types of snow we have seen here in Fairbanks. When I walk outside at night to use the restroom, the outside light hits the snow in the yard and it looks as if the ground has been scattered with diamonds. It’s absolutely spectacular and always stops me in my tracks. Sometimes the snow falls as massive flakes. Other times it is fine and light. Once I walked outside and felt as if I was in a snow-globe, with glitter floating down around me. Magical. Well yesterday it snowed in yet another way. 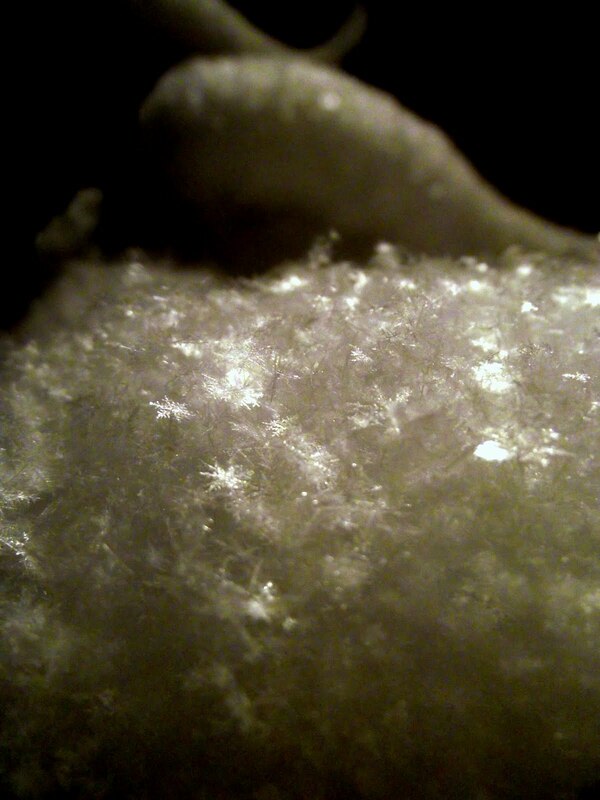 Massive, individual snowflakes that shined like mica. You could look at the fallen snow and see individual snowflakes resting on top. Amazing! Winter is cold and dark, but there is so much beauty in it. See for yourselves! 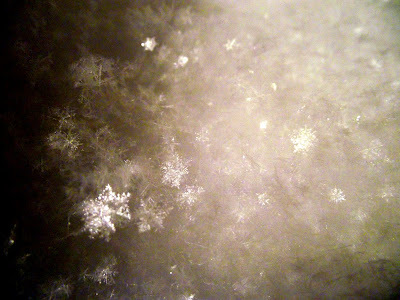 Lee got some great shots of these snowflakes! For a minute, I thought it was a close up of your frozen turkey……! Auntie and I were at Shaker Village on Friday after a bit of an icy rain – the sun came out and everything sparkled like diamonds – too funny that Dottie and Kaitlyn were there on Sunday and we all are sharing these wonderful winter wonderland moments! I just love these snowflakes you posted….Thanks to Lee for taking these photos!